In this paper, we propose a system for the recognition and the automatic learning of hand-drawn graphic symbols in engineering drawings. The graphic symbols and the drawings are represented by attributed relational graphs. 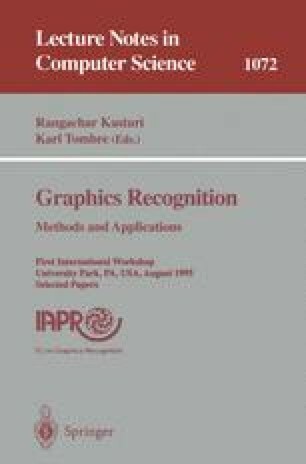 The recognition process is formulated as a search process for error-tolerant subgraph isomorphisms from the symbol graphs to the drawing graph. In the beginning, there is a limited set of graphic symbols that are known to the system. The learning algorithm is able to identify new, i.e. unknown, symbols. From the set of all unknown symbols, representative candidates are selected and integrated into the database of known models. The system has been completely implemented and succesfully tested on a number of hand-drawn input pictures.